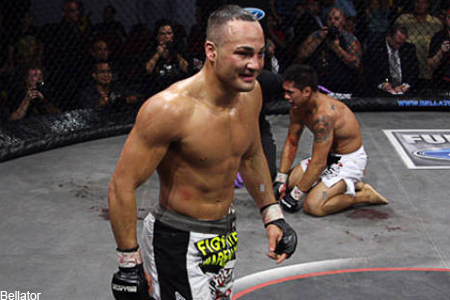 Eddie Alvarez (Pictured) vs. Michael Chandler: Take Two. Alvarez was initially scheduled to defend his crown against Chandler this Saturday at “Bellator 54,” but a last-minute injury suffered by the champion forced him to withdraw from the bout. The Seminole Hard Rock Hotel & Casino in Hollywood, Florida will host their shootout. Alvarez, considered by some as the best 155-pounder not competing in the UFC, looks to remain the company’s only lightweight king. He captured the crown by submitting Toby Imada in June 2009. Alvarez has won 12 of his last 13 scraps, including seven straight. Chandler owns a perfect 8-0 resume, with his last five coming under Bellator’s banner. Alvarez undoubtedly marks the toughest test the 25-year-old has faced thus far. MTV2 will broadcast the card’s main bouts, which will also feature Bellator middleweight champion Hector Lombard. “Lightening” faces veteran Trevor Prangley in a 195-pound catchweight contest.